It's almost Valentine's Day and if you are watching your weight but want to spoil a loved one, how about making this low fat strawberry heart cake? I got the basic recipe from the Slimming World website though I changed it a fair bit. I made this for a food tasting session we were having at my Slimming World group, and since it was only a few days before Valentine's Day I thought it would be a great idea. The cake is meant to serve 6 and would be 5 syns per slice though at our tasting sessions everyone just has a mouthful or small piece of everything that is on offer. Preheat oven to 180C. Mix the eggs and the sweetener. I've got two heart-shaped cake tins that I've had for years and can't remember where they came from, but I knew they would be perfect for this! I sprayed each tin with cake release. Pour half the mixture in each tin and bake for 20-25 minutes until cooked. I wasn't sure how easy these cakes would be to get out of the tins but the cake slightly shrank away from the sides as it cooked and they were very easy to lift out. Allow the cakes to completely cool. Mix 1 250g tub of Quark (a kind of curd cheese with a very mild taste that is low fat and can be used in all sorts of dishes) with 25g sweetener. Pile half the sweetened Quark onto each cake and spread out. Save a little to spread on the bottom of what will be the top cake. Slice the strawberries and arrange over the cake. I placed one cake on top of the other. The actual cakes are relatively thin (did you notice the recipe doesn't contain butter, and doesn't have all that much flour either?) so the strawberries give it a lot of additional height. You could use jam or make a strawberry coulis instead for the middle; I don't know how easy this will actually be to eat but I do think it looks good. 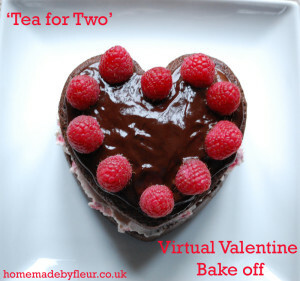 As well as taking this along to my Slimming World group tomorrow, I am sending this to Homemade by Fleur's Valentines BakeOff. 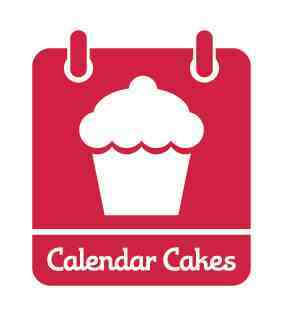 I am also sending this to Calendar Cakes, hosted by Rachel of Dollybakes and Laura of Laura Loves Cakes, as their theme this month is Valentine's.